One of the most unusual projects of my career was Red Riding Hood and the Well-Fed Wolf, an educational film that featured characters representing the various food groups. As Animation Director of the 1989 film, I created and brought to life talking food interacting with live actors who portrayed Red Riding Hood and the Wolf. Stop-motion animation was the main technique used, and traditional puppetry was employed for the shots involving the actors and the talking food together. 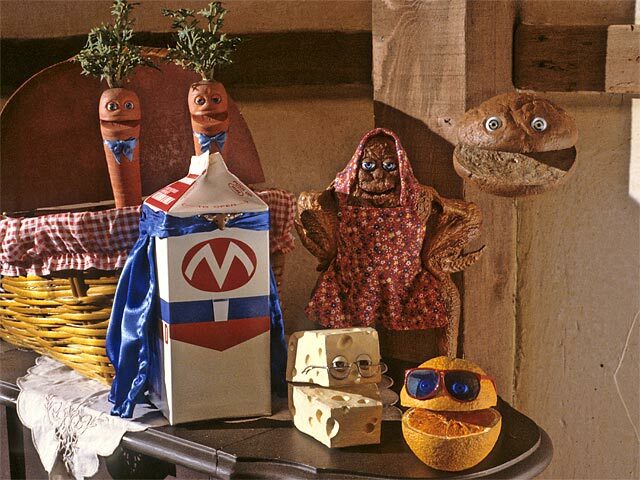 Pre-production of the film required making from scratch a Swiss cheese professor, a chicken cook, some nerdy twin carrots, a surfer orange, a superhero milk carton, and a flying saucer bun. I sculpted the cheese from Roma clay and used real food for the carrots, orange, and bun. All were augmented with clay facial features. Ultracal molds were made from the sculptures, then turned over to puppet expert Niki Matthews for completion. Niki did a brilliant job of finishing the characters, casting them in foam latex and giving them realistic paint jobs. She also cooked, molded, and cast a real chicken, which she dressed up in an apron and a scarf. 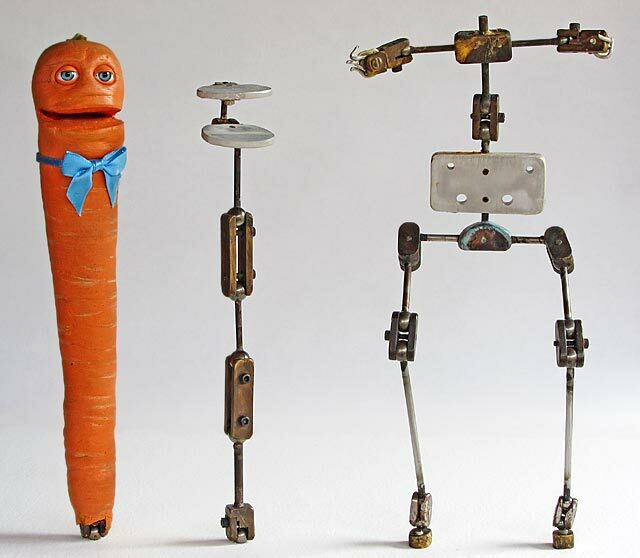 Embedded inside each puppet was a metal ball and socket armature created by Peter Marinello to enable smooth animation. While all the characters were created as stop-motion animation puppets, additional versions were made for live-action puppeteering in order to have them interact with the actors. The souls of the characters, their eyes, were based on realistic-looking Kemper doll eyes. I used an actual milk carton for the “Milkman”, painted over it with a superhero design, and finished it off with a cape made by Niki. The live action shoot with the actors, as well as all subsequent animation work took place in “Grandma’s house”, a set created at the Churchill Films studio. The live shoot required a large crew, usually associated with film production, and took a couple of days. Prior to shooting, I had rigged various furniture and props to allow puppeteering from below the set, out of sight of the camera. Rick Polizzi (now a noted author and producer of “The Simpsons”) assisted me with the puppeteering. It was fun to perform with live actors as it was a nice change from the usual solitary animation process. Director Dan Jackson was very accommodating and he had an understanding of the special effects necessary for shooting the film. Knowing I would later need to match the look of the live action cinematography, I made detailed notes of light readings and character placement for each scene. The shoot ended, the crew wrapped, and the stop-motion magic then began. I animated the characters in order of appearance starting with the cheese, the least complicated of the group. Next came the chicken, which had to be one of the oddest characters in stop-motion history. Although I strove for an appealing result, there was no way to glamorize what she was: a walking, talking, cooked chicken. I wonder if any children became vegetarians after seeing such a surreal, creepy chicken. In contrast, the carrots were both charming and funny in spite of the challenge in animating their leafy “hair”. Their leaves had wires inside, which allowed me to animate vibration and follow through to match their live action puppeteered counterparts. The orange “surf dude” required the use of an aerial brace to suspend him for his jumping shots. Rick Polizzi assisted me throughout the shoot, and he animated two spotlights circling around for the orange’s “Fashion Show of Fruit”. Artificial fruit was utilized for that sequence, pinned into position on an underlying balsa wood base. The “Milk Man” sequence was fairly conventional; however, a group of various dairy containers had to be rigged with aluminum armature wires to achieve movement and talking. Several special flying rigs were also constructed for the “flying saucer” bun scenes. This character’s initial appearance, from out of the picnic basket, required a spinning, rising apparatus. To add motion blur and help hide the wires, I nudged the puppet in the direction of his travel just before shooting a frame. For his floating in place close-up shots, disguising the wires was impossible. The solution was to mount the puppet from behind on a glass sheet, then animate the glass to move the puppet. Black velvet was used to cover anything that might cause a reflection in the glass. The bun had to fly wildly all over the room and that was accomplished by an elaborate “wacky track” system. The method used ½” copper tubing rigged above the set, bent and conformed to the direction the puppet would travel. The puppet hung from the track via an aerial brace and it slid along frame by frame. The creative problem-solving involved with the art and science of stop-motion animation is one of its most rewarding aspects! Red Riding Hood and the Well-Fed Wolf was produced for both schools and libraries by Churchill Films, an educational film company. At the time of its completion in 1989, the market for educational films was in rapid decline. Sadly, Churchill Films ceased production just a few years later. I presume that distribution of this strange fairy tale was probably very low, and today it is a very obscure film.